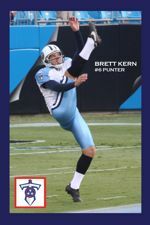 Island native and Tennessee Titans Punter Brett Kern is on the ballot for the NFL Pro Bowl and you can vote! Brett's sister Leanne Stephenson gave us the heads up to find the ballot at the NFL website and that voting will end on Sunday, December 16th. You may vote as often as you like. Go to the ballot, click on "P" under the "Special Teams" headline and look for Brett Kern. Brett is a 2004 graduate of Grand Island High School. This Sunday is the first annual running of the Beaver Island Blackout Cyclocross Race, presented by the Buffalo Bicycling Club on Sun., Dec. 2, 2012. (USAC permit # 2012-3956). It�s open to the public; anyone with a bike and a helmet is welcome to show up and ride the course. The beautiful riverside course is a flat, fast Euro-style loop featuring stretches of sandy beach, forest paths, grass, and pavement. There are great spots for spectating - including a boardwalk elevated above the beach - so bring your friends and family! Beaver Island offers something for everybody. Elite racers can tune up for nationals or worlds, and beginners can challenge their skills on a variety of surfaces. Master's, women, singlespeeders and juniors will have their own separately scored races. All participants in the kids' event will receive their own prize. We will have heated indoor restrooms and a covered registration/awards area, and plenty of free parking. 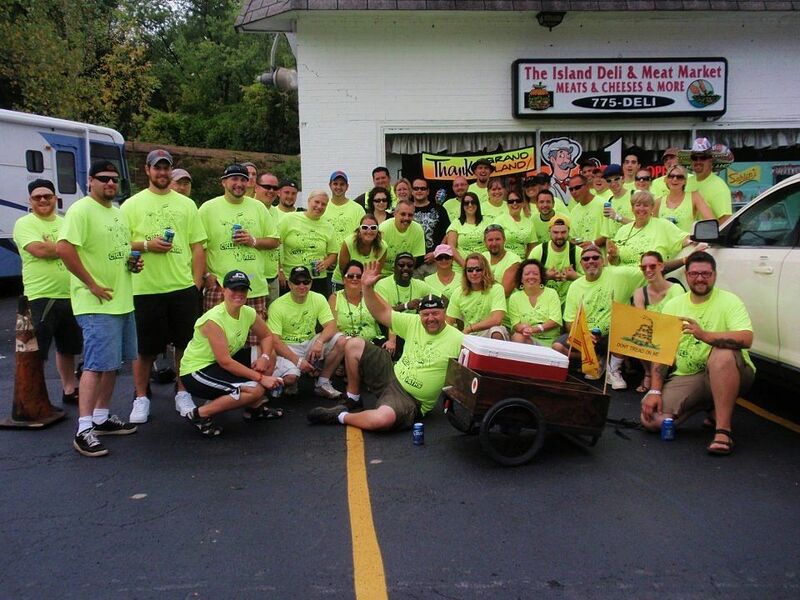 Podium finishers will receive "Wilson Jr." - a unique stuffed beaver award that will make Beaver Island one of the most memorable races on your calendar. We welcome our Canadian friends - those who do not hold a valid UCI lor USAC annual license will need to buy a $10 one-day license. OCA "citizen permit" holders will need to buy a one-day license and can only race in the 11 a.m. events. Register online at https://www.bikereg.com/Net/17618 and save $10! Day-of-race registrations will be available up until 10 a.m. for $35 - but we'd much rather have you sign up in advance. 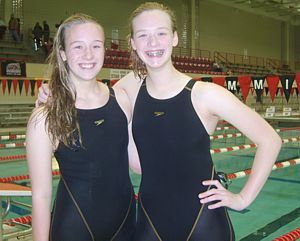 President, Jon Rosen Systems, Inc.
Grand Island twin sisters, Grace and Alexis Fredricks, helped Mount St. Mary Academy finish in second place in the Monsignor Martin Association swim championship at the ECC Flickenger Center on November 6. Grace Fredricks won the 100 free (57.36) and the 100 breaststroke (1:12.05) while Alexis Fredricks won the 200 IM (2:16.92) and finished 2nd in the 100 butterfly (1:00.24) just 0.22 seconds shy of making the State cut time. They were also part of two relay teams that finished 2nd in both events. Alexis finished the season as the second highest point scorer in the league, while Grace finished 4th. The twins are also members of the Tonawanda Titans Swim Club. "Congratulations to the entire Mount St Mary Thunder swim team on a great season." The GI Vikings 14U Travel Baseball team is an independent travel team that practices and plays year round. The team is fundraising to help with the out of pocket expenses to the players and their families. If you are a baseball fan or interested business, see Donation Letter for complete details. It�s not too late to play the most natural course around at Beaver Island State Park�.and get a great deal! Now through November 6, everyone is entitled to senior rates ($12 for 18 holes and $7.00 for 9 holes) when playing from opening until 3 p.m. and carts are just $18 for 18 holes (based on double occupancy). September 21-October 4 - 7:15a.m. - 5:00p.m. October 5 - October 18 - 7:30a.m. - 4:30p.m. October 19 - October 27 - 8:00a.m. - 4:00p.m. October 28 �November 6 - 8:30a.m. - 3:00p.m. For reservations, call 716) 773-2010. September 20, 2012 - At the request of Isledegrande.com, Mike Endres, reports the following spectacular Hydroplane season. Indeed our �Steeler� team had a story book season. 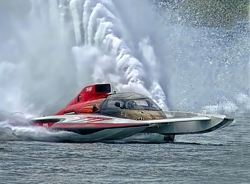 We dominated the Grand Prix Hydroplane circuit by winning 5 of 7 races this year, including the season finale at Beauhornois, Quebec last week. This also clinched us the overall series points championship. The formal award presentation is scheduled for January 2013 in Valleyfield Quebec. The Steeler was a new hull for 2012, built by Henderson Hydroplanes of Brockville, Ontario. 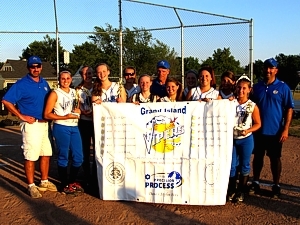 The Grand Island Vipers 14U Girls� Travel Fastpitch Softball team ended their season 13-0 and swept through the playoffs making them the undefeated Metro Girls Softball League 14U North Division Champions and Metro Girls Softball League 14U Playoff Champions. The Vipers were also the 14U AA Division Runner-up in the Battle at Fort Niagara Tournament, 14U Silver Bracket Champions in the Dazzlers Daze Tournament, made it to the 14U Semi-Finals in the Can Am Softball Shootout in Watertown, NY, and most recently the 14U Runner-up in the Niagara/Cambria Falls Invitational Tournament. Congratulations go to Assistant Coach Jim Block, Scarlett Whitman, Grace Fredricks, Alexis Fredricks, Allison Block, Sydney Myers, Head Coach Jim Myers, Sabrina Giordano, Taylor Cecere, Rachel Allen, Grace Giambra, Brianna Brandon, Assistant Coach Tom Giordano and Assistant Coach Henry Grunzweig (not pictured) for an amazing season! A special thank you goes to the Vipers� sponsors: Oh Pour L�amour Du Chocolat, 4476 Main Street, Amherst; Precision Process, Inc., 2111 Liberty Drive, Niagara Falls; Sweet Jenny�s Chocolates & Ice Cream, 5732 Main Street, Williamsville; and Dana�s Stylin� Pets, 2413 Grand Island Boulevard, Grand Island. Where: Grand Island Veterans Park #10. This is a 2nd year team looking to complete a roster. Pitchers, catchers and position players needed. Off Grand Island Players are encouraged to attend tryouts. The team plans to play the 12-game Metro League Schedule, Sahlen�s Indoor Softball Winter League, 3 to 4 local tournaments ando ne of town tournament in 2013. The Vipers will hold off-season practices in a local gym and will participate in hitting and pitching classes through the fall and winter. Please contact the coach if you have questions or are unable to attend these times to make other arrangements to try out for the team. August 2, 2012 . . .The Express U18 Girl�s Premier Soccer Team, coached by former ODP and Daemen College Soccer Coach Hector Vasquez, is holding college prep training/try-outs on Friday, August 3rd at 6:30 p.m. and Saturday, August 4th at 2:00 p.m., at Field 3 at Veteran's Park on Grand Island. In its inaugural season this past season, the team won both the Prince William Icebreaker Soccer Tournament, in Woodbridge, Virginia, as well as the Memorial Classic Tournament in Edinboro, Pennsylvania. The team trains twice a week at Sahlen�s Sportspark and plays its home games at Depew High School. Girls ages 16 through 18 are welcome to attend. Only serious soccer players planning on playing at the collegiate level need attend. For more information call Liz at 432-6086. See "more information." 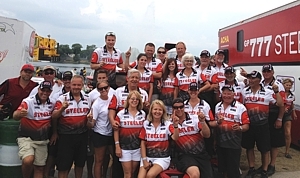 July 14-15, 2012 . . .The �Steeler� dominated the weekend of racing with an impressive double header win at the Valleyfield, Quebec Grand Prix hydroplane race. The Steeler has strong Grand Island connections with Gary Roesch and Mike Endres working as crew members. The Steeler, a new boat for 2012, has now put together three straight wins in the highly competitive Grand Prix class and is on top of the series points championship chase. The Village Open golf tournament results are for Tuesday, June 28, 2012 at the Beaver Island Golf Course. For more information, contact Edward Moore, 773-3817. The Village Open golf tournament takes place Thursday, June 28, 2012 at the Beaver Island Golf Course on Grand Island. In addition to nine holes of afternoon golf, golfers can enjoy breakfast/lunch at the Village Inn from 11 a.m. on. A post-tournament get-together with refreshments will follow at approximately 3:30 p.m., also at the Village Inn - good food, beer and pop at $5. Close to 7000 people participated in the "Susan G. Komen Race for the Cure" which was held on Saturday, June 9, 2012. 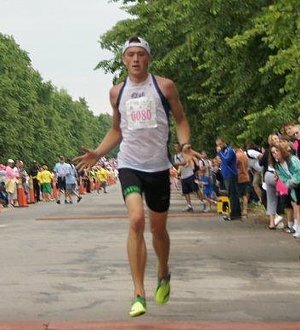 Island native Christopher Carter was the race winner with a time of sixteen minutes and twelve seconds, almost a full minute before the second runner. Mom and Dad, Susan and Ken Carter ran their first race, along with daughter Kelly who came home from Boston to participate. After Chris won the race, he then ran back one mile to run with Mom and Dad and encourage them in completing the race. 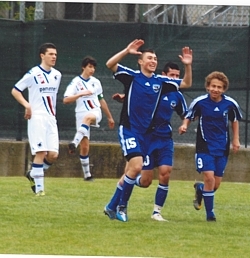 Alex celebrates after his goal against team, Sampdoria in Cuneo, Italy. Alexander Cancilla recently represented the Olympic Development Region 1 Team in an international soccer tournament in Cuneo, Italy. Alex made the New York West team. He later attended the Region 1 Camp and Callback Camp where he was selected to the Region 1 Pool. Alex was one of 18 boys who traveled to Italy and competed with 32 other teams. They ended with a 5-2-0 record which put them in 5th place out of 33 teams. In their toughest game, Alex started the scoring with a goal from his center back position and the U.S. Team won that game 2-1. This was the third event Alex has attended with Region 1. He previously attended a national competition in the Olympic Training Facility in Chula Vista, CA. where he played against the U14 National Team and the other three Regional Teams. Region one had the best record of the four Regional Teams. Alex also had a goal during that event. In addition to ODP, Alex plays for Revolution Empire. He recently participated in an elite training session with the New England Revolution youth staff. 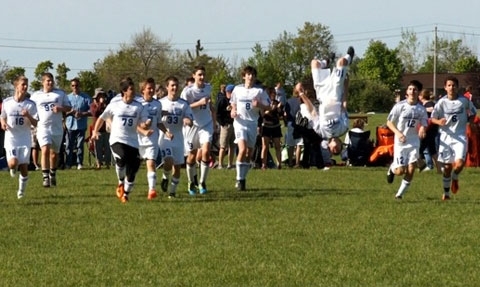 Alex�s club U14 team recently won State Cup in Cortland, NY. Next, the team advances to Lancaster, PA in late June to participate in the Regional Tournament. 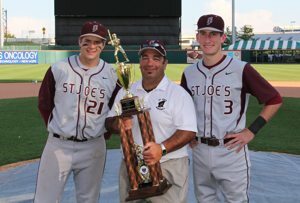 He will be joined by his other Grand Island teammates, Eric Albrect, Frank Cotroneo and Josh Horvath. Alexander works hard at all his goals. He has always maintained High Honor Roll at Grand Island Middle School where he is Student Council President. He recently received his third Pride of the Island Character Award. Alexander has also earned an Academic Scholarship to attend Canisius High School along with his older brother, Mitchell Cancilla who is presently on the U.S. Development Empire Academy team. Alex also has a younger brother, Vincent Cancilla, who is also on the New York West ODP team and will attend the Region 1 camp this summer as well. Soccer has opened many doors for the Cancilla boys. Many thanks to all who run the Grand Island House Soccer League because that is where they were first introduced to the game of soccer. More importantly, it is where they developed a love for the game. Keeping busy, keeping fit and having fun! St. Joe�s beat Nichols, Central Acedemy and St. Francis in their march to the Georgetown Cup. Check out Coach Nascas story detailing the team's road to the Catholic School Tournament win. Grand Island natives Donny Kilian and Alex Kovacs were voted to first and second team All-Catholic respectively for their efforts on the year. The Village Open golf tournament results are for Tuesday, May 24, 2012 at the Beaver Island Golf Course. The Piranhas Swim Club of Grand Island recently donated funds to purchase a Handicap Lift for use in the high school pool. New laws passed in 2010 require all public pools to be handicap accessible. The Piranhas held various fund-raisers to raise over $3,800, which was used towards the purchase. This lift which is permanently housed on the pool deck will allow students and community members equal opportunity to access the pool. 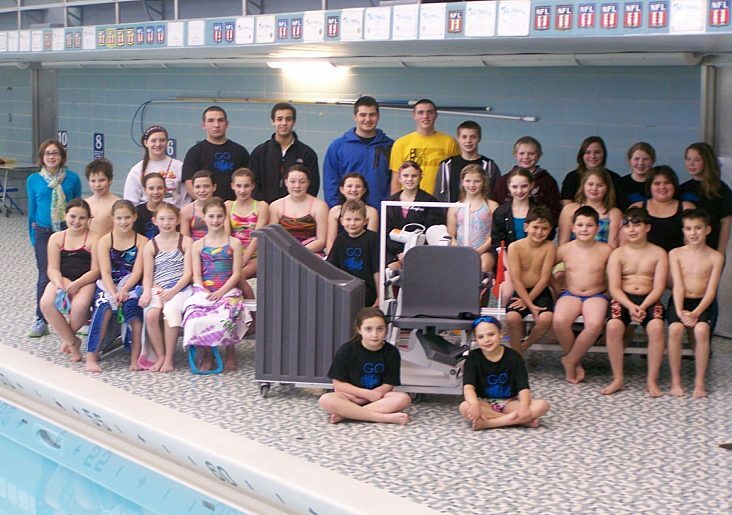 The Piranhas swim year round at the Grand Island High School pool. Team members range in age from 7 to 18. With dedicated swimmers and parents, the swim club plays an important role in our community. If you are interested in finding out more information about the Piranhas Swim Club, please call 773-1413. The 12u Vipers softball season started last Sunday with a win over the Medina Fillies 12-5. Megan Stanley pitched 6 innings and recorded 11 strikeouts, and had good support in the field. Claire Brandon went 3 for 3 with a homerun and a triple and scored 3 times, while Rachael Madigan added 2 hits, one of which was a double, and scored twice. Not to be left out are Grace Federico with a triple, Hallie Mingoia scored twice, and Nicole Castiglione scored twice. The girls will be taking the field this Friday at Cayuga for the Lady Luck Memorial Day Tourney. Buffalo News . . . The Buffalo Soccer Academy Invaders Under-18 girls won the top-ranked division in Canada's No. 1 ranked soccer tournament - The Umbro College Showcase. The team defeated premier teams from Toronto, Ottawa and Nova Scotia to earn their third straight Umbro championship. The BSA Invaders have been ranked as high as No. 10 in the United States. The team is coached by Buffalo Hall of Fame player Rudy Pikuzinski Jr. Players include Gabby Balseca, Emma Bracken, Brittany Brown, Nickie Charboneau, Rachel Cook, Tori Corsaro, Kristi Delabio, Zoe Jackson-Gibson, Alexis Koral, Lexi Kroese, Marissa Mombard, Jenna Panepinto, Lexi Panepinto, Jenny Piaggione, Jenna Raepple, Kori Thorne and Catherine Williams. The Great Lakes Cup Ukrainian soccer tournament will be held Saturday and Sunday from 10 a.m. to 5 p.m. at the Sahlen's Soccer Complex in Elma. This tournament is held in Buffalo once every five years. Seventeen teams and their families will be visiting WNY from Ukrainian communities in cities all around the Great Lakes Region. The tournament is sponsored by Eurodeli and Y.Darmograi. Sacred Heart Academy completed a solid weekend of tennis at the All-Catholics. The team finished second to Nardin in the regular season standings but earned the majority of the All-Catholic spots in the post-season. SHA sophomore, Carlee Conway, repeated as league MVP and first team All-Catholic with another convincing run through the pairings. Freshman, Victoria Parker of SHA, took third place and second team All-Catholic. SHA�s doubles team of Arianna Nasca and Meghan McDonald also took home a third place finish and second team All-Catholic award. It�s the second year in a row for Conway to earn the title. She accomplished another undefeated season going 15-0 to include her play-off wins. The Grand Island native was the number one seed in the weekend tournament. 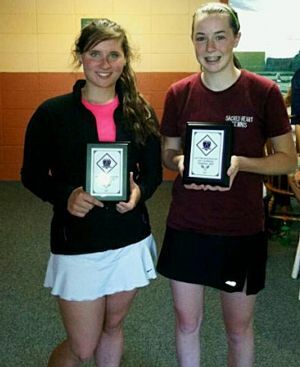 She earned victories over Nardin�s #3 singles player, Gabby Salehy and Mt. St. Mary�s #2 Leah Santiago on Saturday, May 19, 2012 at Sportsplex. The semi-finals featuring Victoria Parker and Madison Bradley of Nardin was the match to watch. Parker also went undefeated in the regular season for SHA at the #2 singles position. Parker was unseeded yet knocked out the #3 seed, Maggie Concannon, from St. Mary�s on Saturday. She used her strong serve and ground strokes to push #2 seed Bradley but lost 7-5 / 7-5 in their semi-final match. Parker went on to defeat Buffalo Seminary�s Sydney Rice 6-0 / 6-3 in the consolation match. Rice earned a victory over #4 seed Alayna Salhah of Mt St Mary�s to reach Sunday�s semi�s. The Island Cycle Paths will hold the third annual Memorial Day pub crawl/ride on Sunday, May 27. The Cycle Paths will meet at The Island Deli & Meat Market, 2488 Grand Island Blvd, at noon and all are welcome to attend. Pictured above was taken at the Labor Day version, which saw over 50 riders. The Buffalo Lacrosse Academy (BLA) is currently accepting interested players of all ages for its summer lacrosse programs. These programs are open to anyone in WNY regardless of residency. All of the summer programs have limited openings and fill up quickly, so please do not wait if you are interested. The My First Stick program for boys and girls ages 3-5. This will take place on Monday evenings in June and July at two locations, one on Grand Island and another at Park School on Harlem Road in Amherst. Children who take part in the My First Stick Program are taught the fundamental rules and skills of lacrosse, all while developing basic hand/eye coordination, engaging in exercise, good sportsmanship and most importantly, having fun. At least one parent should attend to engage in the fun. Children are required to wear eye protection. Interested children will receive a jersey and a stick to keep. The stick includes a locally hand-crafted hickory wood shaft engraved with the players name and year. This stick will serve as an ideal beginners stick and as a future keepsake! The Rising Stars Program for boys in grades 1 through 8. This will also take place at two locations. One will take place at Park School on Monday evenings and ECC North in Amherst on Wednesday evenings in June and July. 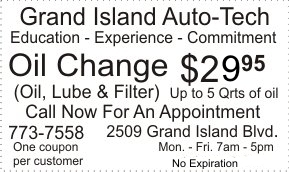 It will also take place Monday and Wednesdays on Grand Island. Full and proper equipment in required. Participants will engage in both practices and games against other teams at each location and grades 3 and older will play games between the Amherst and Grand Island locations. The Summer Varsity Lacrosse League is for high school aged boys. For two hours at ECC North participants will practice and play 2 games each week. The league is in June and July on Sunday afternoons from 3-5. This is directed by Michael Carbery, the head coach at Medaille College. Coaches will include area high school coaches and current college players. The Buffalo Lacrosse Academy (BLA) is one of the oldest and strongest lacrosse programs in WNY. Proudly having over 60 current college players who are alumni of the BLA, the Buffalo Lacrosse Academy is nationally known for its player development programs which emphasize character, coaching and college success. It is also the host of the Lake Erie Showcase and Festival at Old Fort Niagara, a tournament that draws over 65 middle and high school teams from around the country and over 20 college coaches attend each year. To register or to learn more about all of the Buffalo Lacrosse Academy (BLA) programs please go to www.BuffaloLacrosse.com or email INFO@BuffaloLacrosse.com. May 17, 2012 . . .There is no doubt for those who watched this past week ends Akron tournaments games, why soccer (Football) is the most popular sport on the planet. There is nothing boring about the game, when it is played at this level and caliber. 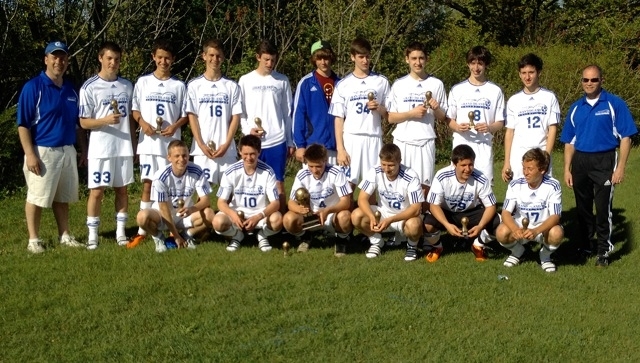 Grand Islands U-16/17 travel soccer team, which is composed of most of Grand Island�s 2012 Varsity team (and a couple of Islanders who play Canisius HS), represented the Island admirably, against much larger clubs. The artistry observed in the night game 3-1 victory against Bradford, PA was nothing short of perfection. GI United completely schooled a very capable team and the opponents� coaches expressed what an outstanding team we had, not only in regards to how talented our players were, but what a classy group of players/boys we have representing us. Three (3) solid wins and a 0-0 tie, and outscoring the opponents 10-2, took GI United squarely to victory, and had we had some important missing players for the tied game, we are quite sure that that game also would have been ours. Goalie Tyler Yockey played an exceptional tournament letting in only 2 goals during the 4 games played against strong competition. There was so much skill displayed over the weekend among all of our players that it is impossible to go into details of individual players as all of them played an important part in securing the CHAMPIONSHIP. It was a brilliant display of talent. Tuesday, May 15, 2012 Niagara Gazette . . .The 16-and-under Grand Island Vikings AAU boys basketball team finished second at the Rochester Spring Classic at Monroe Community College this past weekend. GI lost to Buffalo Storm N-0 in the title game, 60-28, despite 10 points from Anthony Cappuccilli (Niagara-Wheatfield). In the semifinals, Jack Mulcahy (Niagara-Wheatfield) had 16 and Ryan Ross (Grand Island) added 10 as GI beat the Buffalo Titans, 47-40. In pool play, Nick Mansour (Lewiston-Porter) netted 14 and Quinn Carey (Grand Island) scored 10 as GI dropped a 54-48 decision to Buffalo Storm N-0. Mulcahy had 12, Mansour put in 11 and Carey chipped in with 10 as GI topped the Buffalo Titans, 57-41. The Village Open golf tournament takes place Tuesday, May 24, 2012 at the Beaver Island Golf Course on Grand Island. In addition to nine holes of afternoon golf, golfers can enjoy lunch at the Village Inn from 11 a.m. on. A post-tournament get-together with refreshments will follow at approximately 3:30 p.m., also at the Village Inn - good food, beer and pop at $5. The Niagara Falls Sports Hall of Fame is sponsoring a baseball bus excursion to Cleveland to see the Detroit Tigers take on the Cleveland Indians on Thursday, May 24th. The bus will leave Sal Maglie Stadium in Niagara Falls at 7:30 a.m. and return at 7:30 p.m. Cost is $60 which includes transportation and a ticket behind home plate. 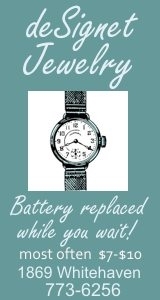 For more information contact John Goodfellow at 773-7186 or goodygoody@verizon.net. After posting a perfect record in regular season conference matches, D'Youville's Steve Beatty (Grand Island) will enter next week's Allegheny Mountain Collegiate Conference men's tennis championships as the No. 1 seed at first singles. Beatty and partner Jericko Gonzalez will be seeded third in first doubles play. The tournament starts Monday at the Oxford Athlete Club in Wexford, PA. The Monsignor Martin�s Girls defending champion has been hard at work preparing for the upcoming tennis season. Carlee Conway from Sacred Heart Academy, won last year�s All-Catholic title as a freshman with a convincing run through the MMA play-offs. She finished the season 14-0. This off-season, she has been hard at work further developing her game with the help of her two coaches; Mark Szafnicki and Andreea Novaceanu (who is the top women�s player in WNY). Since the start of the 2012 calendar year, Carlee has participated in eight USTA Junior tournaments in upstate NY. She has reached the finals in all eight, winning four of them. Her USTA Jr. ranking has steadily improved with these results and is now ranked #46 in the Eastern Section of USTA Jr. Tennis in the 16-Under level. 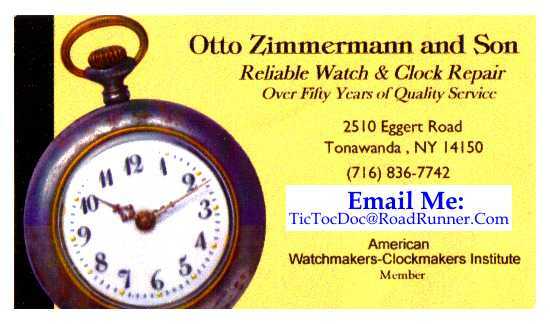 She�s ranked #3 in upstate New York which excludes the Hudson Valley, metro NY/ Long Island and northern NJ. 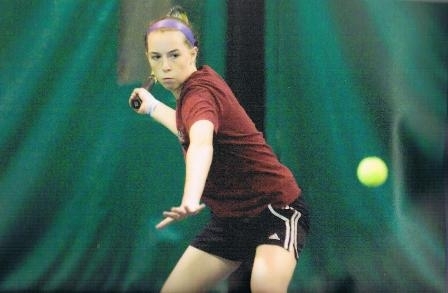 She was selected Female Doubles Player of the Year at the 9.0 NTRP level from Miller Tennis Center�s Buffalo Tennis Series for 2011 this past February (along with her partner, Taylor Cole / East Aurora). The Grand Island native has also moved up to compete in the Girls' 18 level since the first of Dec. 2011. While competing in four 18-year-old tournaments, she has won two of them and reached the finals in all four. This has positioned her to break into the top-100 in the Eastern section with the next publication of the May ranking list. She and mixed doubles partner, Joe Bartello (Will-South) won the BTS Junior Doubles 18-under championship over the Christmas holidays. She credits her coaches with improving her serve and the strategy that goes with that. Szafnicki has been hard at work developing Conway�s different serves and her ability to volley. Andreea has been extremely helpful with improving Conway�s mental preparation on the court. Consistency of ground strokes is critical when playing on the USTA Jr. tournament circuit. Andreea has challenged Conway to be able to hit 40, 50 even 60 balls in a row while keeping them in play and well-placed. Conway will be joined this year at Sacred Heart by freshman Victoria Parker of Lewiston, NY. Parker has been working on her game as well this winter. Conway and Parker are hitting partners in group lessons at Miller Tennis Center in Williamsville. Parker has been participating in select USTA Jr. tournaments over the past several years. She possesses a big serve and very strong ground-strokes. It will make for a very powerful 1-2 combination for Sacred Heart singles this season. SHA returns several players from last year�s Division II championship team. Returning seniors include: Haley Denzak, Claire McMahon, Megan McDonald and Arianna Nasca. SHA coach, Nancy Wingerter will have many positive options to round out the singles and develop the doubles teams for SHA. They will compete in the Division I section of the MMA and will face long-time champion, Nardin Academy twice this season. Sacred Heart aims to accomplish their team goal of winning the Division title away from Nardin this season. SHA begins their season against Park School that is coached by Novaceanu on April 16th. It should prove interesting for Conway and Novaceanu to be on opposite sides of the court! 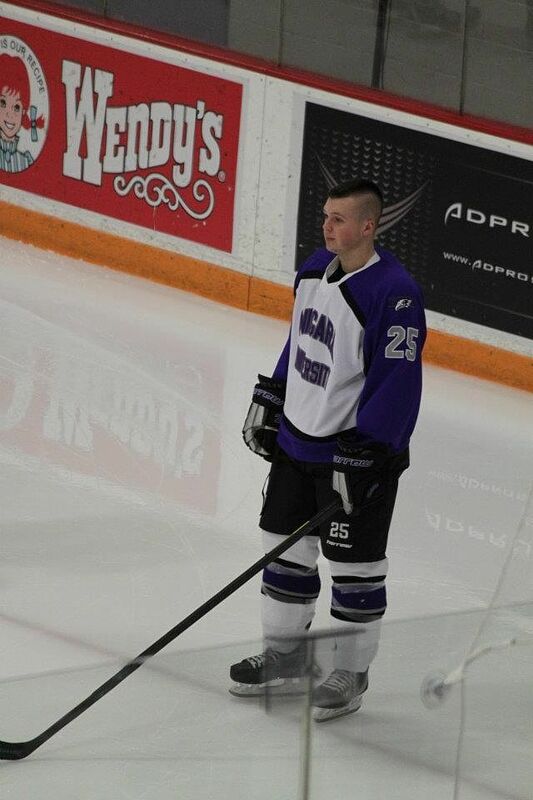 Island resident Justin Frentzel just returned from Lansing, Michigan where the Niagara Jr. Purple Eagles Tier II - U18 Youth hockey team won the Bronze medal at the USA Nationals. The Niagara Jr. Purple Eagles won the NYS Championship on March 18th in Cheektowaga, New York to qualify for Nationals, out scoring their oppenents 43-1. Justin is a senior at St Joseph Collegiate Institute and plans to attend Suffolk University in Boston this fall. 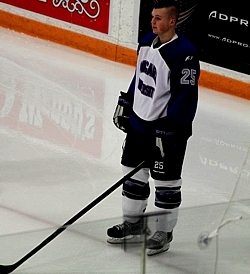 Justin has been associated with the Niagara Jr. Purple Eagles team for over 8 years. His team has won the NYS Championship in the U10, U12, U14, U18 divisions and have advanced to Nationals four times. He has two National Bronze medals and two fifth place trophies. Justin is the son of Mark and Pattie Frentzel. 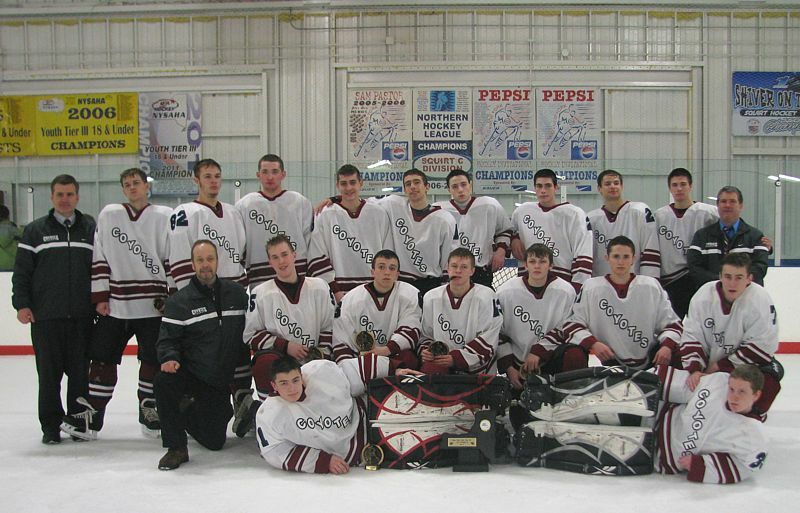 The NC Coyotes Midget 16U team followed a victory in the Gene Harrington Spring Classic Tournament at Hyde Park Arena with an incredible ride to the finals of the New York State Championships. The team was 4-0 in the Gene Harrington Classic and defeated teams from Canada and Long Island to complete their sweep and capture the tournament title. Following the Harrington Classic the team swept Wheatfiield AA in a two game set that proved to be a tune up for the New York State Championship. The Coyotes were considered an underdog going into the tournament but finished the round robin round 2-0-1 placing them first their division. In the semi finals the job did not get any easier playing one of the hottest teams in the tournament, Bear Mountain. The Coyotes played one of their strongest games yet defeating Bear Mountain, a pre-tournament favorite 4-2, setting up a trip to the finals late that afternoon against Valley. The Coyotes jumped out to a 2-0 lead in the first but Valley fought back hard in the second and tied the game at 2. Valley got a goal with 12 minutes left in the third but the Coyotes came storming back to tie it at 3 with just 3:16 to go. Unfortunately with just 50 seconds left Valley tallied and went up 4-3. That's how the contest ended. The coyotes had a great run exceeding the expectations of many and finishing their spring season 9-1-1. Congratulations are due for a group of boys that came together to accomplish what many thought they could not. The team is made up of players from Niagara Falls, Grand Island, Niagara Wheatfield, Lewiston and Amherst. Jack Mulcahy (Niagara-Wheatfield) scored 20 points, including the game-winning jumper, for the 16-and-under Grand Island Vikings in a 55-53 double-overtime win over Eastside Rochester in the championship game of the Buffalo Storm AAU boys basketball tournament on Sunday, March 25, 2012. Quinn Carey (Grand Island) added 10 in the win. In earlier action, Mulcahy and Carey scored 13 and Chris Galvano (N-W) put in 10 in a 60-44 win over North Tonawanda. Mulcahy netted 17 and Carey scored 13 in a 65-47 win over Wayland-Cohocton. Jadon Wegrzyn (GI) canned 11 in a 54-34 win over Tonawanda. Freshman Max Hyland will represent Niagara University in a Hockey Skills Competition and All-Star Game on March 17th in Cleveland, OH, where forty of the best ACHA players nationwide will showcase their talents. Max is a second semester freshman at Niagara majoring in Education with a concentration in History and minor in Special Education. Along with his athletic accomplishments, academically Max has excelled by earning a 3.79 GPA his first semester at Niagara! Grand Island resident and member of the SUNY Oswego Equestrian Team (OSET), Brooke Chamberlain, won her first blue ribbon at a show hosted by OSET at Lehman Farms in Rochester on February 11-12th. 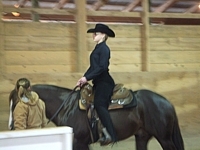 Brooke took first place in the Walk Trot Division and The SUNY Oswego team won all three of the shows overall. Fuccillo Chevrolet was a platinum sponsor of this event. The Niagara Police Athletic League (PAL) will hold its 30th annual Sports Awards Dinner on Sunday, February 26, 2012 in the Como Restaurant, Niagara Falls. Island resident Kevin Kulikowski will be honored during his 11th season as a volunteer assistant coach with the Grand Island boys basketball program. Kulikowski is also the director of Young Life Ministries in WNY. The cancer survivor is a husband and father of three children. 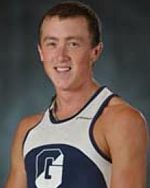 Chris Carter, a senior at SUNY Geneseo majoring in history, began running track as a 7th grader on the Grand Island High School team. Chris recently helped Geneseo's distance medley relay post the second-best Division III performance of the season at the Spire Midwest Open in Geneva, Ohio, with a winning time of 10:02.40 and placed fourth in the 800 meters with a time of 1:53.78, which stands seventh nationally. Chris broke the school record of 154.89 in the 800 which he set last year. He is a Grand Island High School graduate, Class of 2008. Week two didn't go as smoothly as week one for the Vipers 12U as they ran into an Amherst Lightining team that was much more experienced. Claire Brandon had an excellent game at shortstop and kept the Lightining from getting runners on base when the ball was hit her way, but it wasn't enough as the Lightining won 12-0. The 12u Vipers (team Federico) are now 1-1 on the season and will be playing the Rochester Lady Lions. The Vipers hope you continue to follow their season at Sahlens and in weeks to come you will be introduced to the whole team. Grand Island 13U Travel Baseball Fundraiser will be held at 7 p.m. Saturday, March 10, 2012 at the Grand Island Moose Lodge #180, 2524 Grand Island Blvd. (near KOA). Baskets may be viewed anytime after 4 p.m. See Information. The Grand Island Vipers 12U (Federico) Team won their first indoor softball game of the season on Sunday, January 8, 2012 at Sahlens Sports Park beating the Oakville Lady Hornets 9-0. Jen Hinaman scored 3 runs, Grace Federico made two key stops at home, and Megan Stanley struck out 8 batters on her way to a no hit shutout. All the girls played well on both sides of the ball and are off to a good start. The annual Grand Island Hockey Alumni Game will be held at Hyde Park on Saturday, January 21st at 7:30 p.m. The cost is $20 player, which includes one guest." There will be a Chinese auction, basket raffle, pizza, pop, and beer after the game. To sign up, email gialumnihockey@roadrunner.com. Those unable to attend but would like to make a donation are asked to contact the planners. See Hockey Alumni. Copyright © 1995-2010 All rights reserved.